The Ambertrail journey began in 1973 with the purchase of our first Golden Retriever, Cory. At the time I was actually looking to buy a “Golden Lab” . I went to a local dog show in search of a breeder where I met Martha Covington Thorne who introduced me to the Golden Retriever breed which I did not know existed at the time. I had been brought up with black labs and now had decided to get a ‘Golden Lab’ as a hunting companion. Martha quickly corrected me for referring to the Yellow Labrador as a Golden Lab, by showing me the difference. She took out a Yellow Labrador from one of her many crates and showed it to me, my response was that was what I was looking for. Martha then showed me a Golden Retriever ........WOW! what a gorgeous dog I thought! My next question was “Do they retrieve ducks like a lab?” Martha confirmed that the Golden was every bit the hunting companion that the Lab was. Martha just happened to have a female Golden Retriever puppy there and of course I immediately wanted it. The pup was unfortunately promised to someone else; but if the family did not show up by the end of the weekend, she was mine. Needless to say, I spent two whole days at a show I knew nothing about, keeping one eye on the puppy crate and the other on the activities going on in the rings. Sadly, the family did show up at the same time as I was walking towards the crate to claim my new pup. I think, that if there were not children involved, I would have made an offer these people could not have refused. I wanted her that badly. But, as fate would have it, she was not meant to be mine. Instead, Martha gave me the phone number of the puppy’s breeder and that night I called. Sure enough the breeder had one puppy left and it was a female. She was already twelve weeks old. I picked her up a few days later and “Val’s Dolly” (Cory) became the f oundation of Ambertrail Golden Retrievers. Martha Thorne was definitely an important mentor. She was there right from the beginning. She taught me about sportsmanship and most of the “how to’s” of the conformation game. I was truly blessed to have known this woman. As well, Barbara Tinker, started out around the same time Ambertrail was born. She had high standards and was an ambitious, gifted person. Her goals were similar to mine, so it was natural that we would gravitate towards each other. Torch Flinn was an incredibly knowledgeable person and gave advice freely. Jackie Mertens and Topbrass Goldens, Ambertrail has had a few of her dogs over the years and admire her tremendously. Mickey Strandberg, for her Mioak’s lines. There are many, many more people who have touched Ambertrail and helped along the way, including Dave and Jane Thompson, Bob Stark, Hugh Brown, Phyllis Philip, the list is endless. Cory was “my dog” right from the start and we became an amazing team! Cory was a ‘natural’ retriever. She learned very easily and loved to show off. I barely had time to take her to obedience classes before she became a UD. She literally went from earning her CD to earning her UD in less than one year. Completely amateur trained and handled. In between obedience titles, she became a Show Champion! Oh yes, the day she earned the final leg for her UD, she was five weeks pregnant! “Mac” a very nice working retriever who never got the last point to get his title, still he was a solid producer and a fun animal. When I saw Sprint as a puppy I recognized something special in him. At the time, I already had three seven month old pups from our first all field bred litter. By this time our bloodlines were split, show and field. We had a lot of dogs and the last thing I needed was another dog to train! I was at a trial when I first saw Sprint, he was then 6 months old and had little or no training as his breeder was deciding whether or not to keep or to sell him. I had been a big fan of his father “Jake” and could see much of Jake in this puppy. I simply had to have him! After some negotiation I managed to get to the point where his breeder could not refuse the offer. I was a happy camper and put him in my truck although I had no idea what had just bought! In fact that weekend when judging a trial with my old friend and fellow field trailer Tony Grossi and while we were out setting up a water test we decided to air the pups (Tony had an 8 month yellow lab pup. We turned Sprint and Tony’s dog out to run around and play. Tony decided to throw a bumper in the water, his pup immediately tore after it. The second Tony’s dog began swimming, Sprint leaped from the shore and seemed to fly over this dog. Sprint landed in the water ahead of Tony’s dog and easily beat his lab to the mark. Tony made me an offer right there and then for Sprint ( If you knew Tony you would understand what it took f or him to want to buy a Golden!). I said thanks, but no thanks, and took him back to the truck. In his Junior year, Sprint went on to be the 2nd Top Junior Dog in Canada, Top Junior Dog in Ontario and Top Junior Golden Retriever in Canada. His first Open year went very well for him. He earned both his FTCH. and AFTCH titles by the time he was four. His MH title was also earned easily. I completed most of Sprint’s early basics. Sprint’s other friend and very important trainer was Dave Thompson who took him south and finished Sprint’s Master Hunter title. Sprint was always very strong i n the water. To be super critical of him, I would say that it was the “go bird” of the first series of the land marks when I would hold my breath. Sprint was always so high going to the line on the first series. If you got him through the first test, he usually finished the trial. He would get more collected as the trial went on. I feel Sprint is one of the finest looking Goldens I have ever known. Height to weight, overall balance, coat, front and rear angulation, tail set, feet, bone, head, full dentition, temperament, all well above average. If it were not for a ‘very’ slightly undershot jaw, this gifted dog would have been shown in the conformation ring, and perhaps even earned a Dual Championship. He was an extremely healthy dog all through his life. His breeding record certainly shows he can reproduce himself. I am extremely proud of Sprint’s “Get” accomplishments’ Field Champions, Master Hunters, Senior and Junior Hunters, hunting dogs, obedience titles and awards, etc. The list is endless! 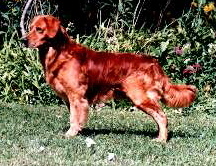 Sprint will be long remembered as a Golden Retriever who contributed well to the breed. The above dogs and time frames bring the history of Ambnertrail to the late 90’s. Since that time Ambertrail has been fortunate to have produced, trained and owned some great Goldens. Probably the most famous is my current Open all age dog and Triple Champion.............Push!